Ornellaia, Estate's flagship wine, was first produced with vintage 1985, from an extremely careful selection of the vineyards Merlot, Cabernet Sauvignon, Cabernet Franc, Petit Verdot, grown on Ornellaia. The clusters were hand-picked into 15-kg boxes and then graded and selected by hand on a double sorting table, before and after destemming, and finally soft-pressed. Each grape variety and single vineyard block was vinified separately. Fermentation took place in stainless steel tanks at temperatures between 26-30Â°C for one week, followed by 10-15 days of maceration on the skins. The malolactic fermentation took place primarily in oak barriques, 70% new and 30% once-used. 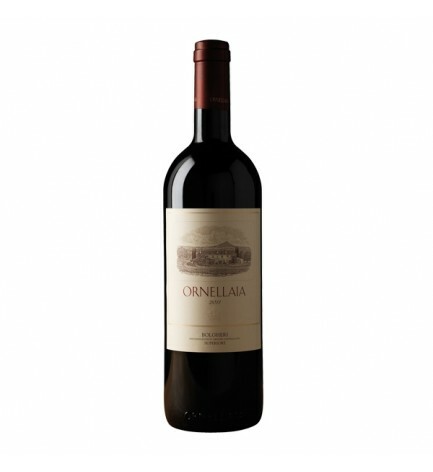 The wine then remained in barriques, in Ornellaia's temperature-controlled cellars for about 18 months. After the first 12 months of maturation, the wine was assembled and then returned to the barriques for an additional 6 months. After bottling, the wine aged a further 12 months prior to release.